This is an indexing project commissioned for the texts of the 3rd edition of this longstanding volume by the editor, Prof. Paul E. Lovejoy of York University, Toronto. Released in October 2011, the edition is available for order on the website of the publishers, Edinburgh University Press (EUP) at http://www.cambridge.org/gb/knowledge/isbn/item1166735/?site_locale=en_GB and via major online retail stores including amazon.com and Barnes and Noble. 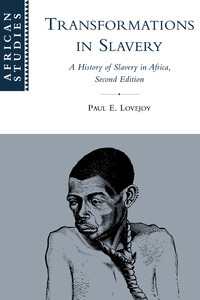 This history of slavery in Africa from the fifteenth to the early twentieth century examines how indigenous African slavery developed within an international context. Professor Lovejoy discusses the medieval Islamic slave trade and the Atlantic trade as well as the process of enslavement and the marketing of slaves. He considers the impact of European abolition and assesses slavery's role in African history. The book corrects the accepted interpretation that African slavery was mild and resulted in the slaves' assimilation. Instead, slaves were used extensively in production, although the exploitation methods and the relationships to world markets differed from those in the Americas. Nevertheless, slavery in Africa, like slavery in the Americas, developed from its position on the periphery of capitalist Europe. This second edition revises all statistical material on the slave trade demography and incorporates more recent research with an updated bibliography.